Memorable Mother’s Day Gift Baskets Under $50! Watermelon Soap and Lotion Set – $38.99 – While the weather might have us believe otherwise in several areas of the country, it truly is spring, and summer will be here soon enough! And while oranges are awesome, lemons are lovely, and apples are oh-so-appealing, there is no fruit so sweet and summery as watermelon. Our ‘Sweet Scent of Watermelon’ gift set includes a chrome sink caddy with darling containers of juicy watermelon scented hand soap and hand lotion. Each is accented with a decorative miniature kitchen utensil, and a watermelon dish towel is thrown in for good measure. Cute, useful, and attractively priced – Mom would be proud! Wine and Cheese Gift Basket – $39.99 – Just like wine, your mom has grown even better with age, and her appreciation for a fine glass of wine has also likely grown. Though hardly a ‘new’ beverage, wine is more popular now than it has been in many years, making our Wine and Cheese Gift Box a superior Mother’s Day gift. Inside you’ll find Wine Glace, American Vintage wine biscuits, and a delectable cheese spread. She can reuse the box time and again, always remembering your thoughtfulness! 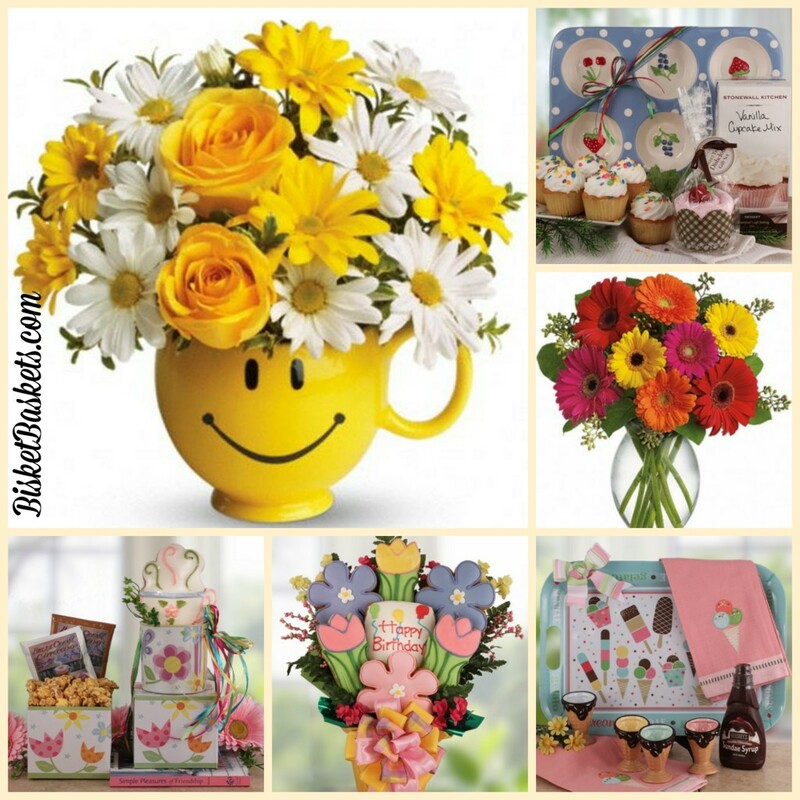 Say ‘Happy Birthday!’ with a Spring Gift Basket or Bouquet! While the temperatures in many parts of the country are still a bit too chilly to feel like spring, we have to believe that warm weather truly will win the battle against the icy grip of winter. It seems that this year more than any in recent memory, the low temps and snow just aren’t willing to give up easily. We’ve decided that we simply can’t wait any longer. Maybe we aren’t too keen on wearing a heavy coat in April, and maybe it broke our hearts a bit to turn the heat back on once we jumped the gun a bit too early one warm day, but there are certain spring things that we can embrace, and we’re doing it! I haven’t yet taken my ice scraper out of my car trunk, and I haven’t yet switched my winter comforter for my spring quilt. I’m trying to keep the weather in mind where it makes sense to, even if I wish I didn’t have to. But what I have done in spite of unseasonably cold days is started ‘springing’ up my home, office, and gifts. I’m going by the calendar and my mood on these things, even if I have to pay attention to the thermometer for others! If you’re looking Winter square in the eyes as well, telling her that, ‘Enough is enough, already!’, consider sending along one of our spring gift baskets or floral bouquets for the next gift-giving occasion on your list. We’re hoping warmer days will be here to stay very soon, but no matter how long that takes, we’re saying ‘yes’ to spring in every way we can from here on out!